The third one is a parked domain, it apparently expired. Oops. Okay! This clearly has some style to it. Seems like Pascal_Snake_Case. I’m not super hyped about this, but it’s fine. Syntax discussions are like the tabloids of programming language discussion. They’re fun, but they don’t really have any educational comment. One thing I will point out: are apostrophes used for method calls? Otherwise, this seems to be fairly Pascal like, which I think makes sense given what I know about Ada. I can click run and see it execute right there! Awesome. The Ada programming language was designed from its inception to be used in applications where safety and security are of the utmost importance. The SPARK programming language is a formally verifiable subset of the Ada language which allows developers to mathematically prove program correctness through static means. There are two courses, introduction to Ada, and introduction to SPARK. 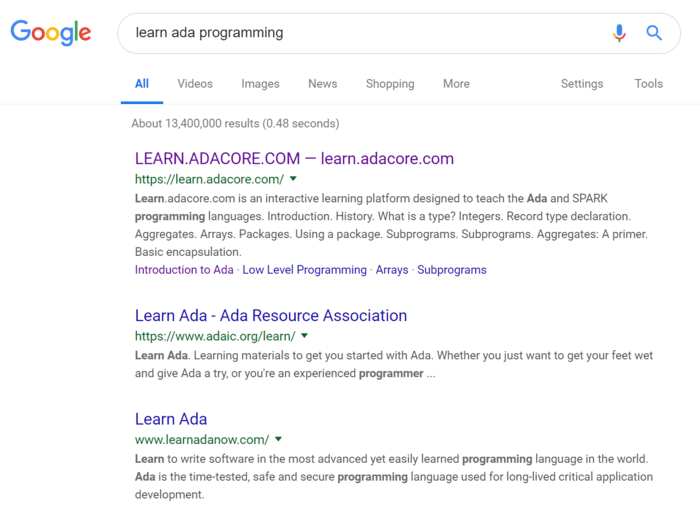 I think SPARK is cool but I’ll learn that after I learn Ada itself. I also do like books, but let’s do that first. I’m not going to write everything about the book as I read it, but I will say that I like the basic structure here: first some history, then imperative programming stuff, then talking about types. After that it gets into packages, more type stuff, privacy, generics, exceptions, tasks, interfacing with C, the standard library, and some appendices. This feels pretty logical. Time to do some reading, I’ll jump back here at random points with notes. I heard that Ada 2020 is a thing; seems like they’re on a roughly 7-8ish year timeframe generally. Cool. We got a shout-out! That’s nice. This is interesting; it seems to suggest that readability and verbosity are synonymous. I often find concise things easier to read, personally. This is, of course, subjective, and I wonder how I’ll feel after I learn more of the language. This makes a lot of sense, especially given the time it was created. Greet is a procedure, and the main entry point for our first program. Unlike in C or C++, it can be named anything you prefer. The builder will determine the entry point. In our simple example, gprbuild, GNAT’s builder, will use the file you passed as parameter. It will use it as … parameter? Like, is the fact that we called the file greet.adb the reason it calls Greet? It’s not clear to me at the moment. Integer'Image is a function that takes an Integer and converts it to a String. It is an example of a language construct known as an attribute, indicated by the “‘” syntax, which will be covered in more detail later. Ah, it’s not a method call, it’s an attribute. In Ada, an integer type is not specified in terms of its machine representation, but rather by its range. The compiler will then choose the most appropriate representation. Very interesting. I wonder how well-defined these mappings are, for example, if you need to call a C function, you’re gonna need to give it the correct sized type… I’m sure I’ll get to that. Okay, this is the good stuff. Ranged integers are something people always say Ada is better at than Rust; I wondered if this was a static or dynamic check. It is a dynamic check. Cool. I’ve always wanted to know! As mentioned previously, every “built-in” type in Ada is defined with facilities generally available to the user. While unconstrained arrays in Ada might seem similar to variable length arrays in C, they are in reality much more powerful, because they’re truly first-class values in the language. You can pass them as parameters to subprograms or return them from functions, and they implicitly contain their bounds as part of their value. This means that it is useless to pass the bounds or length of an array explictly along with the array, because they are accessible via the 'First, 'Last, 'Range and 'Length attributes explained earlier. Awesome. This is the way to do it, for sure. --        ^ Pre-defined array type. Hm, wrong length. What is the right length? This particular emoji is four bytes, so let’s try to set it to 5, since we start at 1. Nope that doesn’t work either. What about 4? Very suspicious. Anyway, I’m guessing it’s ASCII, maybe it’ll tell me later. One last feature of Ada arrays that we’re going to cover is array slices. It is possible to take and use a slice of an array (a contiguous sequence of elements) as a name or a value. Hell yeah, I love slices. Ah, bummer. I guess I’ll have to read up on those separately. Returning variable size objects in languages lacking a garbage collector is a bit complicated implementation-wise, which is why C and C++ don’t allow it, prefering to depend on explicit dynamic allocation / free from the user. The problem is that explicit storage management is unsafe as soon as you want to collect unused memory. Ada’s ability to return variable size objects will remove one use case for dynamic allocation, and hence, remove one potential source of bugs from your programs. Hmmm, I wonder how it is doing this. Doesn’t that still dynamically allocate in Ada? Ada doesn’t have a tuple construct and does not allow returning multiple values from a subprogram (except by declaring a full-fledged record type). Hence, a way to return multiple values from a subprogram is to use out parameters. I love tuples, oh well. While reading an out variable before writing to it should, ideally, trigger an error, imposing that as a rule would cause either inefficient run-time checks or complex compile-time rules. So from the user’s perspective an out parameter acts like an uninitialized variable when the subprogram is invoked. Hmmmmmmmmmmmmmmmmmm. This seems extremely against Ada’s safety focus. Each time I run it, I get a different number. Seems bad? Second, Ada has made pointers as safe and restricted as possible, but allows “escape hatches” when the programmer explicitly requests them and presumably will be exercising such features with appropriate care. Seems great! I’m very here for this. … but they have null. Of course they do, given the timeframe Ada was developed. Oh well. Okay, so new is a keyword, and is in the language. But freeing is an unsafe standard library API? I guess this makes sense, similarly to how leaking memory isn’t unsafe in Rust. Feels weird, though. I guess, reading more, the idea is that you should basically never need to do this yourself. I think this is where I was getting caught up earlier with the “return an unknown type” bit too. It is allocating, but since you’re not typing new, you’re not responsible, and so that’s safer. That makes sense. I hope my understanding is correct here, but I’m not totally sure. This does mean that it feels like allocations exist, but are hidden from you, the user. That’s okay, but it’s very different than Rust. Ada’s variant records are very similar to Sum types in functional languages such as OCaml or Haskell. A major difference is that the discriminant is a separate field in Ada, whereas the 'tag’ of a Sum type is kind of built in, and only accessible with pattern matching. Ah. Yeah so that’s why the emoji didn’t work. Did that crash the compiler earlier, is that what was happening? Wait, is this the same new keyword as before? Do generics require heap allocation? That is a reasonable design, I’m just a bit surprised. Ada exceptions are not types, but instead objects, which may be peculiar to you if you’re used to the way Java or Python support exceptions. I found this sentence confusing; aren’t the objects in Java or Python as well? When I was reading this sentence, halfway through, I thought to myself “oh, like the stuff I know, cool” and then the second half was “this is unlike the stuff you know”. Hrm. Cool, this is a big topic I’ve been wondering about. As we’ve just seen, as soon as the main task starts, its subtasks also start automatically. The main task continues its processing until it has nothing more to do. At that point, however, it will not terminate. Instead, the task waits until its subtasks have finished before it allows itself to terminate. Ah interesting, this is different than Rust. Well, Rust’s standard library, anyway. I wish it explained if tasks are system threads, or if they’re green threads. I did some googling, and apparently this is implementation-defined. GNAT uses system threads for some of the same reason that Rust decided to expose system threads. Seems good. The pragma Assertion_Policy statement is used to force the compiler to generate code to check the precondition. Design by contract works at runtime. This is something I always thought was true, but was never actually sure of. Cool. Ah ha, this answers my question from earlier. Cool. Dot notation exists! But only if you’re actually using objects, er, “tagged types”.